Giovanni Antonio Pandolfi Mealli (ca 1630 - ca 1669) was a early/middle-Baroque Italian composer, who played in the courts of Archduke Charles Ferdinand of Austria at Innsbruck. Although Charles Ferdinand was a despot, he was also a great lover of music and employed many musicians from all over Europe. There is not much known about Pandolfi's (or Mealli's) life, and his only surviving works include 2 sets of 6 violin sonatas from op.3 and op.4 published in Innsbruck in 1660 and another set published in Rome in 1669. This CD records the 12 violin sonatas of op.3 and op.4. Although Harmonia Mundi titles it as "complete violin sonatas," because to my understanding, the 1669 collection also includes several other violin sonatas. In that sense, it is technically correct to label is as "complete," but the title name does make the marketing very attractive. These violin sonatas are written in stylus fantasticus, where the sonata as a whole is played uninterrupted, allowing a free-flowing of musical ideas. The slow passages can be melodic and meditative, while the fast passages are improvisatory that can run wild, requiring considerable technique to play well. Although it is by no means extremely difficult by today's standards, but it is no easy task to blow off either. 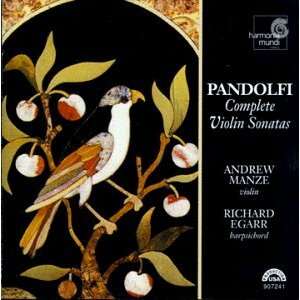 Each of the violin sonatas bears a title name, after a court musician of Pandolfi's time. He probably named them after friendship, or probably just out of pure respect, which was routinely done in those times. The name "La Stella" is the only name that appears twice, once in op.3 and once in op.4. The recording artists on this Harmonia Mundi release are celebrated period instrumentalists in their respective instruments, Andrew Manze on the Baroque violin and Richard Egarr on the harpsichord. I have had the honor of attending their separate live concerts, Manze twice and Egarr once. However, through a less-than-ideal selection of pieces, their performances have been less than memorable for me. I enjoyed my first Manze concert much more though. However, their pairing has always been spectacular, and this is definitely not just because they are in a recording studio setting. Back in the early 2000s, when I first met biberfan on the internet, we both commented that Manze's violin playing had a distinct sound that was not too much to our liking. Sometimes it sounded dry and other times a bit scratchy. I don't know if it is the instrument itself, or it resulted from more forceful bowing, but it was definitely unmistakable. Over the years, I have gotten past this detail and have let the music and performances take over. Manze's playing is inventive in the sense that he improvises, alot..... This is evident when you compare the original scores and realize how much was added on. He fills in gaps with interesting passages, and the chords he fills in at the downbeats are rich and provide a nice effect. I have seen another Amazon reviewer dismiss Manze as academic and not professional. While everyone is entitled to their own opinion, this criticism might seem unusually harsh. In general, Manze plays with good spontaneity and creativity that leaves a lasting impression. With so many period violinists out there today, how many can you honestly say are able to do this? And by this, I mean really make it memorable, not just good solid playing? As for Egarr, he may be one of the finest continuo players out there. Instead of content being the violin's sidekick and keeping the beats, Egarr weaves a completely different texture, the harpsichord being on equal terms with the violin, filling appropriate chords and improvising to give the pieces much needed variety. This is not your Baroque violin sonata in the style of Handel, Vivaldi, or Bach, but of a much older style. Those unfamiliar with these pieces and style will find a dash of freshness, and Manze and Egarr's playing definitely add on to the excitement. This is among my two or three favorite discs featuring Andrew Manze (the other two, perhaps, his Corelli and his Handel, and in this case, both with friend Richard Egarr). I'm at a loss for words in describing Manze's playing style; "academic" is the term chosen by some, and in HM's marketing, they say "gypsy" is his style. Those two terms don't mesh. I might also add that at times it is "stiff," but not in the terribly negative sense that the word,alone on a page, imparts to us. This music is good - people ought to listen. It's hard to avoid Manze - he's recorded so much good music. Pandolfi's music is hardly known. Manze has thankfully recorded him twice (but not identical programs). He's precise, he's sometimes careful, and as you note, he is a real baroque player - adding his own stamp. And that stamp includes his signature sound. I respect him immensely for having a "sound" and a "style" that you can put a finger on (the same could have been said for Goebel, who I can often hear even out of the texture of his own ensemble). Who is to stay what this music sounded like 300-400 years ago? That's always the ultimate question that plagues us. Instead, Manze and Egarr do their thing. In this case, it is fresh, despite the music's age. I forgot to comment that during one of the Q&A session with the artist after the concert, Manze demonstrated how he would play the same piece to different audiences on consecutive days. It was a slow passage from a Vivaldi concerto, where he played one modestly (targeted towards religious nuns) and another one heavily embellished (targeted towards a group of school children). It was spontaneously played, and I don't think he would go through the length of preparing this for just a Q&A. My point being, I think his ornaments and improvised passages on the recordings are probably fresh thoughts as well, although giving off a more careful feeling to it. I am currently in Austria, and these posts were pre-written. I was in Vienna and will be in Salzburg in a few days. Probably due to the summer season, I don't see alot of early music happening around. I was sightly disappointed to see how much Mozart was marketed here, almost making it cheap. Also, the "typical" classical music scene literally stops at Haydn and goes no further. Maybe one or two mentions of Gluck.